VMWorld Vegas 2016 was a fantastic show for us at Cohesity. Our booth had a plinko board on one side where attendees could win exciting prizes and on the other side we provided demonstrations of the Cohesity DataPlatform and DataProtect products. All of the demos were received enthusiastically, but the SQL Adapter demo was one of the most requested during the show. The demo highlighted Cohesity’s ability to protect Microsoft SQL Server databases and restore them to a specific instant in time. My colleague Gaetan blogged about this capability here and given the excitement we saw, we thought we’d bring it to the show. So for those of you that may have missed it in Vegas, here’s a brief summary. 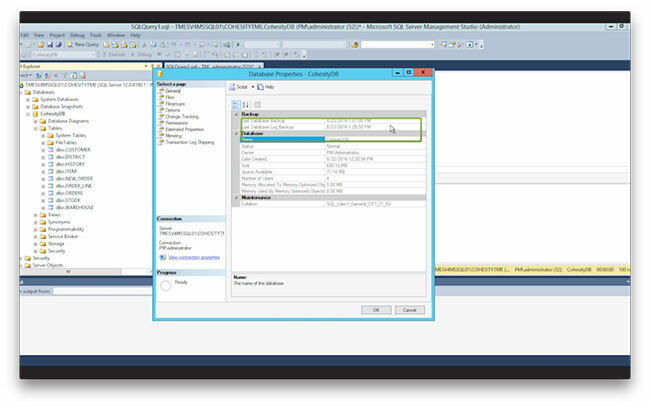 The demo began by showing Microsoft SQL Server Management Studio showing a live database named CohesityDB. We quickly reviewed the lastname column of the database to show active data. 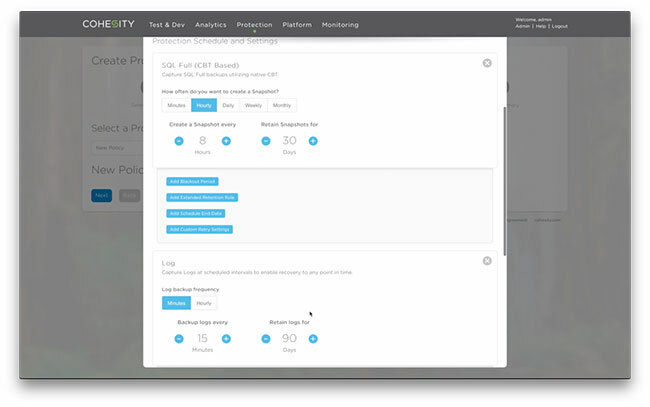 We then logged onto the Cohesity web interface and registered the SQL Server as a valid database host and created a protection policy and a backup job. 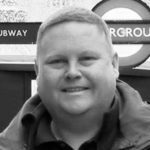 The policy was set to retain full backups every eight hours with 30 day retention and we also set the policy to backup logs every hour and retain them for one day. 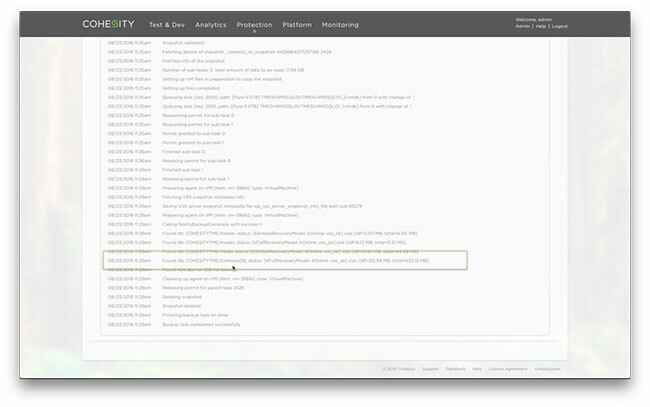 The backup job automatically runs per the set policy upon creation. 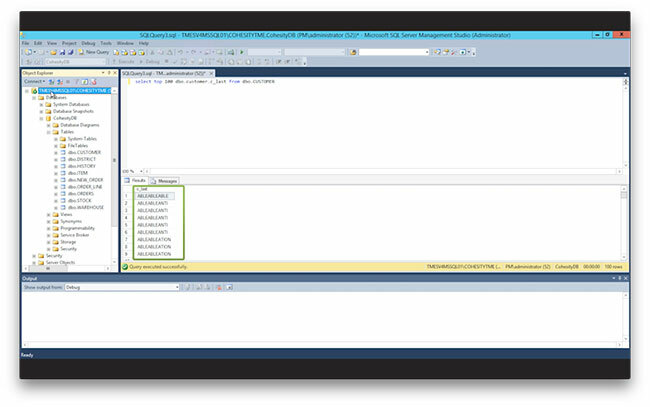 The SQL Adapter jobs utilize Microsoft SQL Server credentials to gain access to the VSS and SQL API sets on the SQL host. We use those native APIs to take consistent snapshots and backups of the databases and log all of the operations. 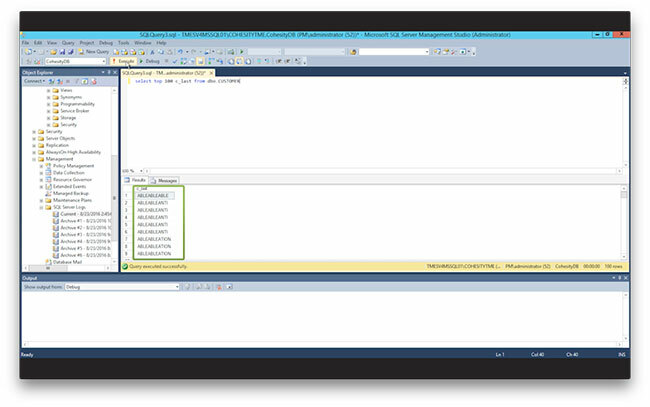 You can also see that the SQL server recognizes it has been backed up through the use of the Microsoft APIs. We then simulated a corruption by running a SQL update statement that replaced the alphabetical characters with punctuation and other characters. At this point we get to show the coolest part of the demo: point-in-time restore. We navigated to the restore page in the web administration interface, selected a specific job and then checked the “Restore to a New Time” switch. From the window, we can easily drag a slider or type in a specific second as the recovery point. Once the recovery point was set, we started the recovery. Cohesity again utilizes Microsoft APIs to restore the SQL server to the specific point in time utilizing the full and log backup data captured with the SQL Adapter policy and job. Any point-in-time recovery enables powerful restoration capabilities for not only production databases but also for dev/test instances. Using this powerful feature, a backup or database administrator and restore to the exact instant before a user made an error or a misbehaving application caused an issue. 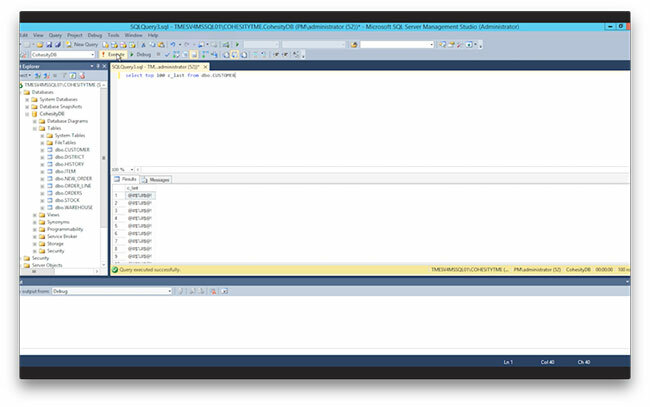 We completed the demo by showing that the same database instance was online and showing the valid data once again. 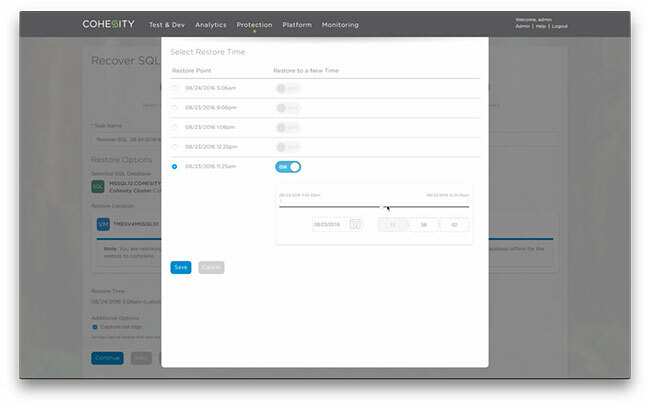 The SQL Adapter demonstrates how deep integration with Microsoft APIs can be easily protected and restored to any point-in-time utilizing policies and without the need to manage backup agents.